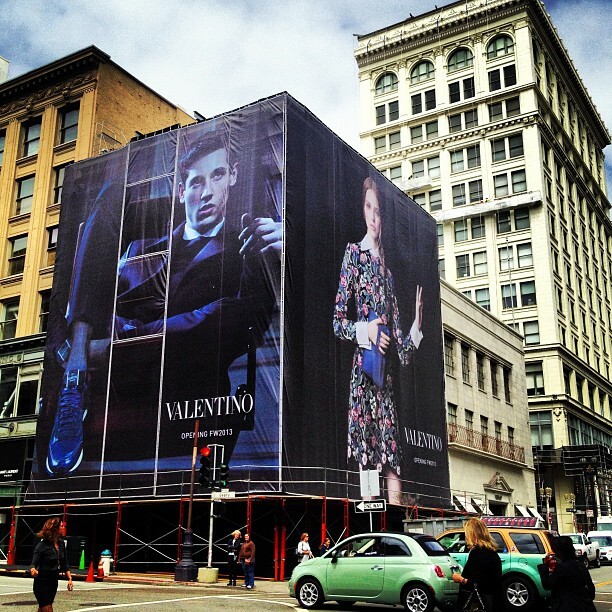 San Francisco design has taken a big Italian leap forward with the opening of the Valentino store at Grant and Geary. Designed by British architect David Chipperfield, the store incorporates a distinctly Italian sensibility, an early 20th Century vision of elegant palazzo living combined with the latest in technology. Think symmetry, grand gestures, intimate rooms, monolithic use of material as ornamentation, fiber-carbon technology and LED lighting. The overall feeling is created with a custom palette material, texture, color, surface and light. The Valentino store takes over the location formerly inhabited by Juicy. (I’m sorry Melissa B, but I think it is a disservice to call it Juicy Couture!) The Juicy store layout was awkward, with poor spacial flow augmented by a small foot print. David Chipperfield made the most of the difficult first floor, completely gutting the interior and reorganizing the layout. The store now has two distinct entrances, with mens clothing on the Geary street entrance and the 4th floor, and women’s accessories on the more prestigious Grant Street entrance, and women’s clothing on the 2 and 3. “The store is now organized into a series of room, as in a classic Italian Palazzo, transitioning from grand public to intimate private spaces. Each room is “characterized by an iconic element that speaks the Valentino language: a vertical mosaic of mirrors in the shoe area or the American walnut accessory shelving evocative of a gentleman library; the grey leather used in the dressing rooms – the most personal and coziest space; the white plaster walls; the timber parquet; the terrazzo marble on the floors and molding (with inset rugs of black and white marble). First, think of your homes as a progression of public to private spaces, from open to intimate. Each space should have a distinct feeling, yet be cohesive to the whole. Second, interiors should be conceived as volumes instead of merely surfaces to be decorated. When affordable, a room of one material is more impressive and provides greater design impact than an small application of the same material on a single surface. Let’s say that you live in one of the new San Francisco high-rise condos. Consider painting the walls and ceiling of your entry hallway the same color (not white!). This will create an enveloping whole, and will set the mood for your apartment distinct from the public hallway. Powder rooms can also be a great place to add drama, using paint, wall covering, stone, or wood…do the room in one material only for greatest impact. Third, history should guide our design, but we should not turn our back to our own times. The fact is we live different lives and society has changed. Technology is aiding this shift in how we live. Technology also enables us to create lighter, stronger materials that our more ecologically friendly, allowing us to update traditional designs. Fourth, create your own unique vision or fantasy of how you want your space to feel. Make your own home feel unique to yourself. Buck the trends…create your own trend.